Rep. Rick Staples, D-Knoxville, (right) was accused by an unnamed woman of holding onto her waist during a meeting in his office, after making inappropriate comments about her appearance on multiple occasions. A Democratic state representative has been found in violation of the legislature’s sexual harassment policy, but colleagues have stopped short of recommending his removal or any disciplinary action. Staples was accused by an unnamed woman involved in Democratic politics. The woman claims Staples held onto her waist during a meeting in his office, after making inappropriate comments about her appearance on multiple occasions. The allegations first appeared last week in The Tennessean. In an interview with reporters after the story was published, Staples called the allegations a “political character assassination,” and said he was not under investigation, even though the subcommittee had found him in violation of policy days before. "I'm under no investigation at this point," Staples said then. "I haven't been found guilty of anything." Letter from the House Workplace Discrimination and Harassment Subcommittee regarding allegations made against Rep. Rick Staples, D-Knoxville. The letter is dated April 1, so it appears to call that claim into question. But when asked this week why he told reporters he was not being investigated, Staples told WPLN he stands by his statement. 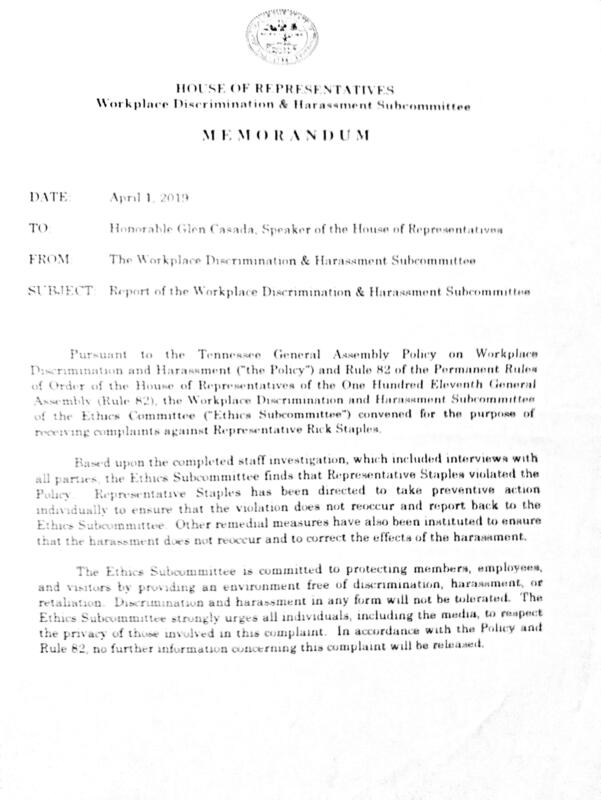 According to the letter, the House Workplace Discrimination and Harassment Subcommittee conducted “interviews with all parties” before concluding the report on Staples. It is unclear what those remedial measures were. The subcommittee said no further information on the complaint will be released. Staples is the fourth state lawmaker facing sexual misconduct allegations in the past four years. The others were Franklin Republican Jeremy Durham, who was expelled from the House in 2016 after investigators substantiated he'd sexually harassed nearly two dozen women; Shelby County Republican Mark Lovell, who resigned in 2017 after being found to have inappropriately touched a woman at a bar; and Waynesboro Republican David Byrd, who's been accused by three women of sexual misconduct when he was their high school basketball coach in the 1980s. Byrd was re-elected last fall, after the allegations were made. The so-called “fetal heartbeat bill” is likely to not move forward this year in the Tennessee legislature. The Senate Judiciary Committee decided Tuesday evening to send the bill (SB1236/HB77) to summer study. A Knoxville Democrat has been accued of sexual misconduct, but it's unclear what penalties or scrutiny he faces. State Rep. Rick Staples says the allegations from an unnamed woman involved in Democratic politics are "politically motivated." The woman claims Staples held onto her waist during a meeting in his office, after making inappropriate comments about her appearance on multiple occasions. Equal rights advocates are warning Tennessee lawmakers about consequences the state could face if they move forward with legislation that targets the LGBTQ community. The General Assembly is considering about 10 measures that could impact whether LGBTQ people could adopt, or use a bathroom that matches their gender identity.